What this is NOT: a guide to the hottest toys of 2018. What this is, however? A compilation of really really insanely good toys. 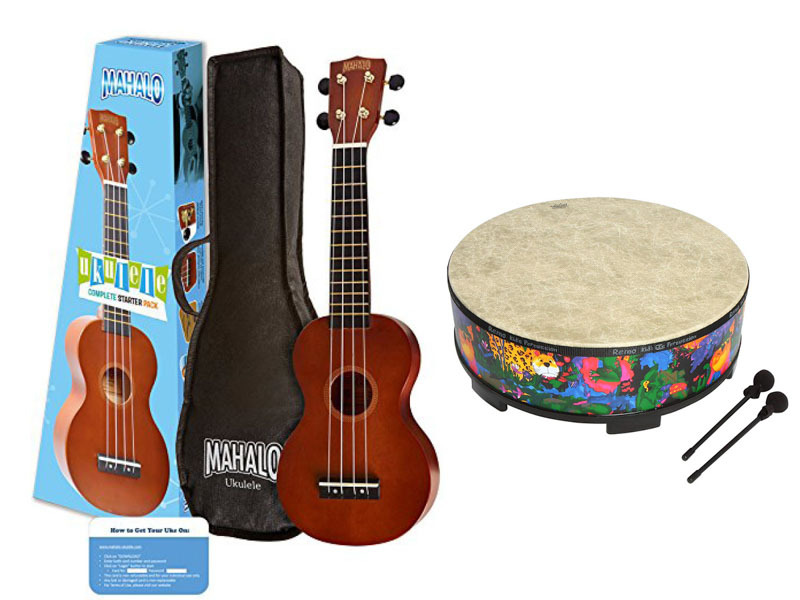 Most of these toys aren’t flashy, and no one is going to claim any of these are the “it” toy for this season, but this is a list designed to stand the test of time. 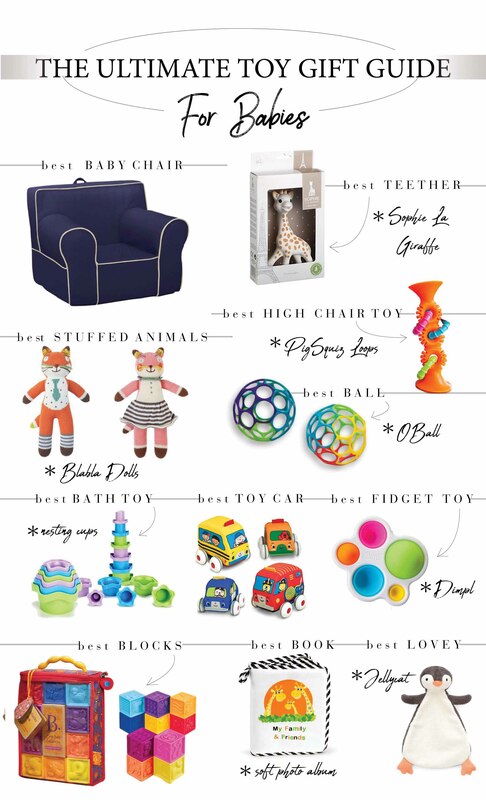 Shana and I sat down over coffee and racked our brains determining all of our favorite toys — we were so thrilled we had so many of the same picks: the toys we were excited to play with as moms when our kids were these ages, the toys that our kids played with over and over and over again, and the toys that WE ourselves buy as gifts for all of the other kids in our lives that we love. Obviously, it was super-challenging to narrow it down to a manageable number of “bests”. There are a lot of amazing toys out there.There are also so many incredibly extensive (and somewhat overwhelming)toy guides, so our aim was to curate a list that’s as easy to follow as possible, with only our true favs. 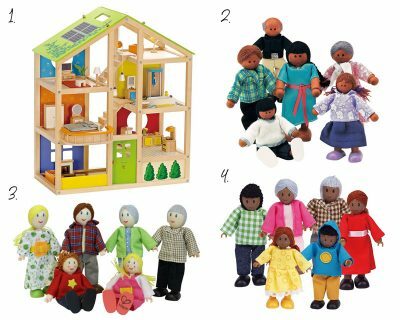 We divided the toys by age (you can click on the age tabs below to navigate), but there is a bit of age overlap within our suggestions, so please take a look at the other age groups as well — there are SO many toys that are wonderful for multiple age groups! Beka Blocks are the “real deal” high-quality wood block set. They are beautiful, and feel nice and play nice, and will be the blocks you pass down to your grandchildren. Our wooden block set lives in our family room and is played with by toddlers, little kids, and big kids alike. Sky scrapers, castles, roller coasters for LEGO guys…imaginative options are endless. 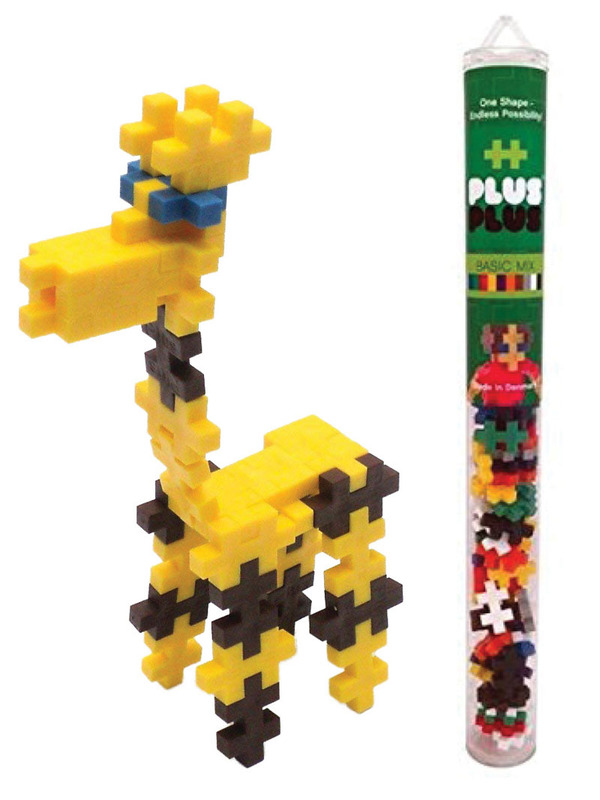 Melissa & Doug also makes a more economical version that are just as fun to play with. Extra fun to have their traditional and architecture sets. Oh, Magna-Tiles,…how I love you! If you don’t own these, buy them, and buy as many as you can afford. You can’t have enough. They are wonderful for so many ages, and for hours and hours of creative fun (my 10-year-old will still build giant castles with these.) A light table is a crazy-fun addition to Magna-Tile play (in addition to all sorts of other tracing and art fun)! Yes, Melissa & Doug have such fun costumes; we own plenty of these for sure. 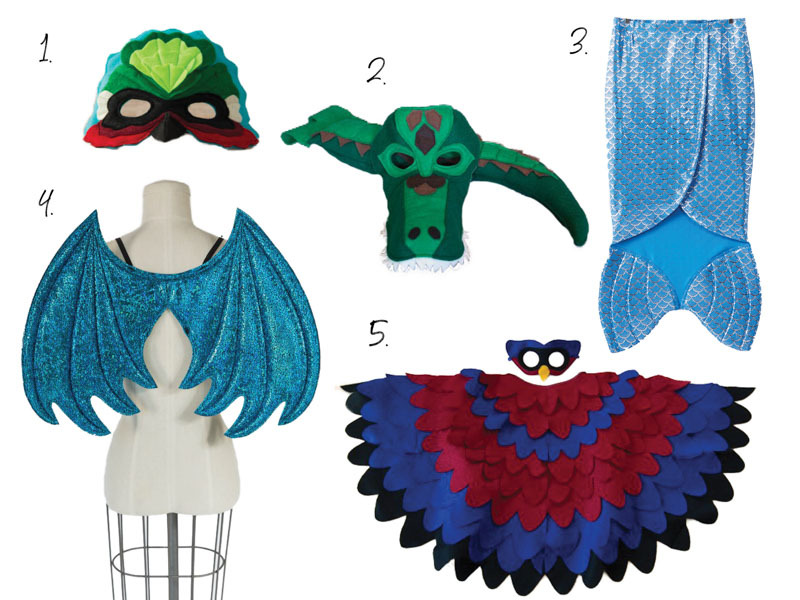 But my kids often gravitate to our hand-crafted costumes that my mom has made, or to the beautiful masks and capes at Shana’s house, handmade by artisans on Etsy. Hunting Faeries and Mighty Bunny are two of our favorites from Etsy. Hanna Anderson also has a fun selection of PJs that coordinate with high-quality costume accessories… love the double-duty fun! 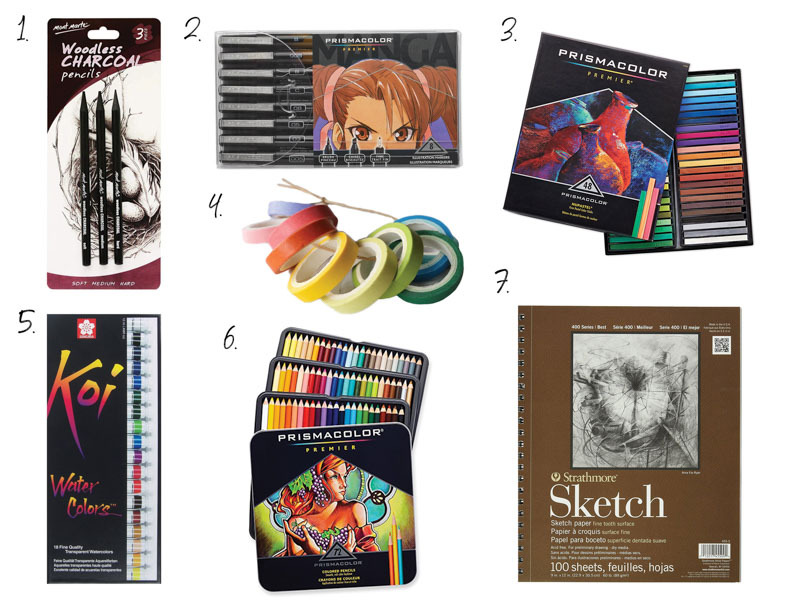 We are HUGE believers in high-quality art supplies (not wasted on kids — to the contrary, we think). So much good art play to be had with these (for you and them), and one of the best gifts for all ages. Board games are my favorite family activity by far! We play board games on vacations, board games on holidays, on weekends, and really…any time we can fit them in. My kids learned how to play chess at their pre-school. Having a beautiful handmade chess set that is out all the time is a wonderful way to encourage everyone to play as much as possible. Rumikub, Quirkle, and Jenga (bonus that this one looks nice on the coffee table) are our family go-tos, and have been since the kids were toddlers. So many creative ways you can include little ones even if they can’t play by all the rules. Castle Panic is Shana’s family favorite…you should see her eyes light up when she talks about playing. Shana always has a huge pack of extra tubs of Play-Doh in her basement, and I have found nothing better for play dates than getting out a TON of tubs of Play-Doh and a TON of Play-Doh toys, throwing everything on our table, and letting the kids have at it. Buy extra shape-making machines…they’re the tools everyone fights over. This is the best toy for “growing into”! Baby will crawl up and down on this over and over and over. But later on, it will be flipped over and used as puppet theater, turned around and used as a toy store counter, piled on top others and used for obstacle courses, crushed by my husband when the kids insist he sits in them too…and then occasionally, yes…used by the kids to sit in and read their books quietly. Can be personalized with their name — a truly wonderful baby gift! I know…I know…we’re all kind of sick of seeing Sophie, but it’s the teether all four of our kids (between S and I) ALWAYS reached for over all other teethers. You all know, you HAVE to have a good high-chair toy — something the baby can play with to distract them when you have to cut up more of whatever it is they want more of. And most importantly, something that sticks to the high chair, that they can’t chuck across the room at you when you aren’t cutting up whatever it is that they want fast enough. 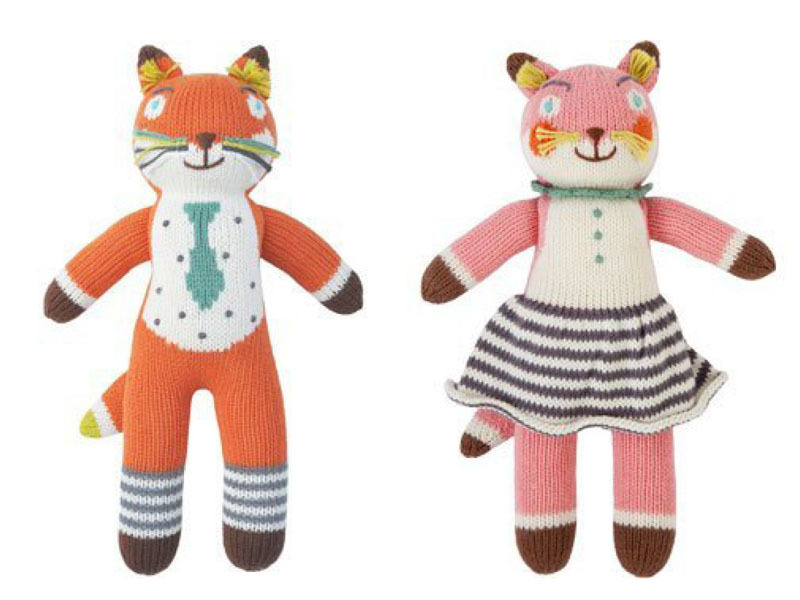 These are such lovely stuffed animals. 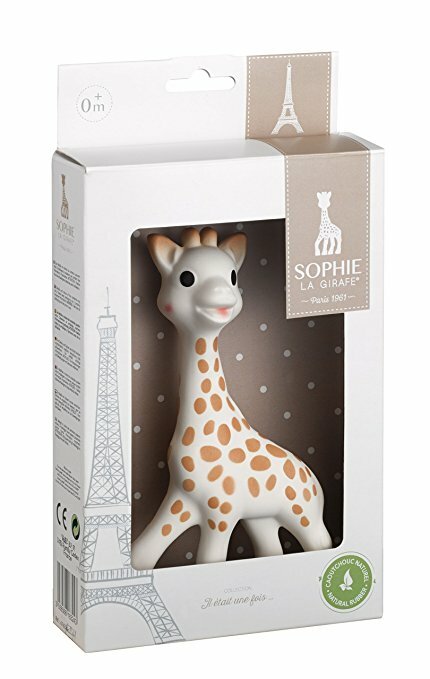 With the variety of animals available, you can find the one that fits your little one’s personality perfectly. Soft, cuddly, 100% cotton, and ready to be loved for years. Tiny fingers LOVE this ball. Enough said. 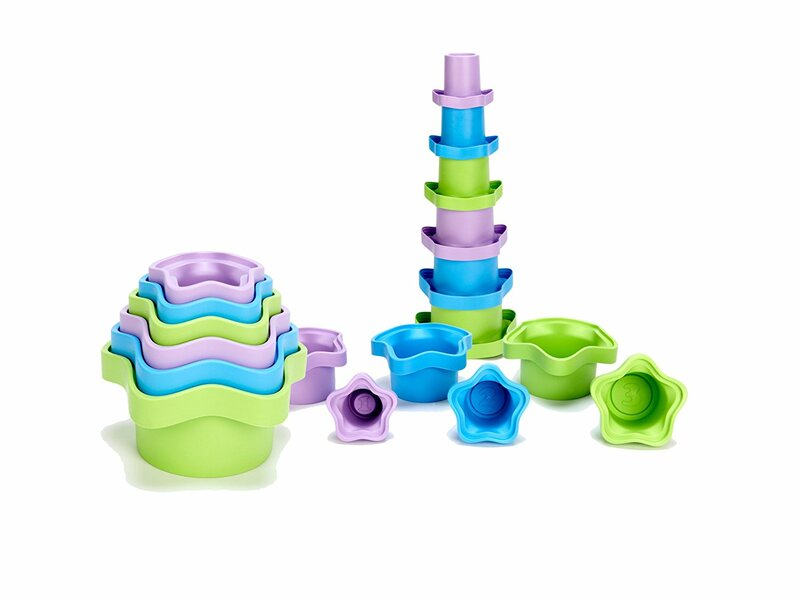 Even with the variety of complicated and snazzy bath toys available, Shana and I both came back to nesting cups as our favorite. Scoop water, pour out, repeat. That’s all you really need for bathtime fun. 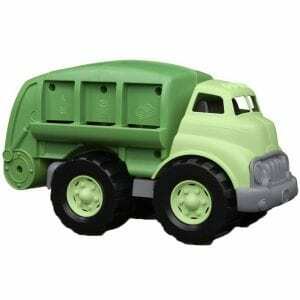 Added Bonus: Green Toys are made from 100% recycled plastic milk containers. 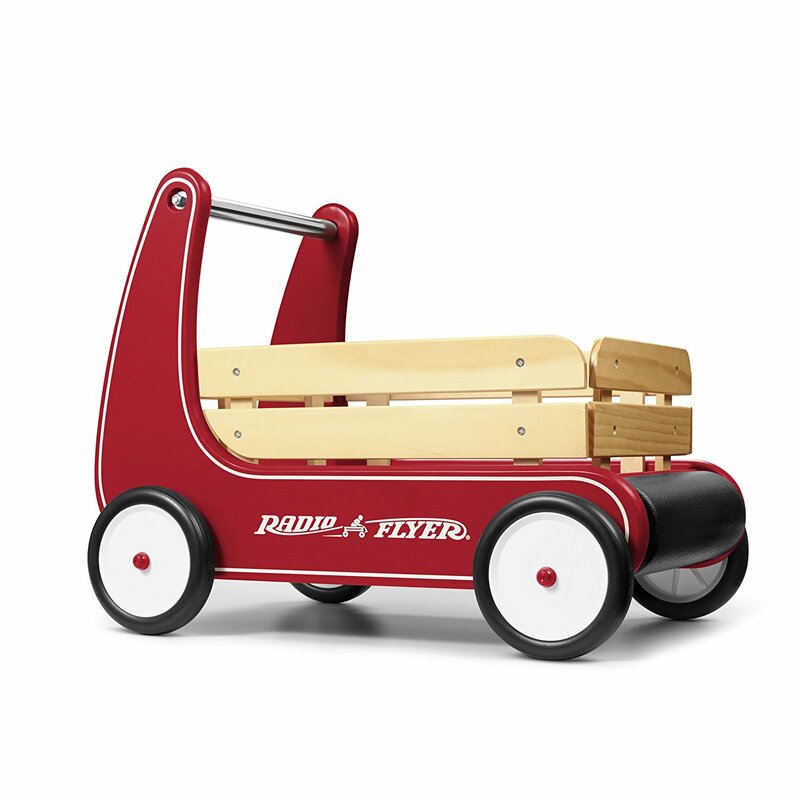 My kids have always loved a good pull-back car….like magic it is to them. 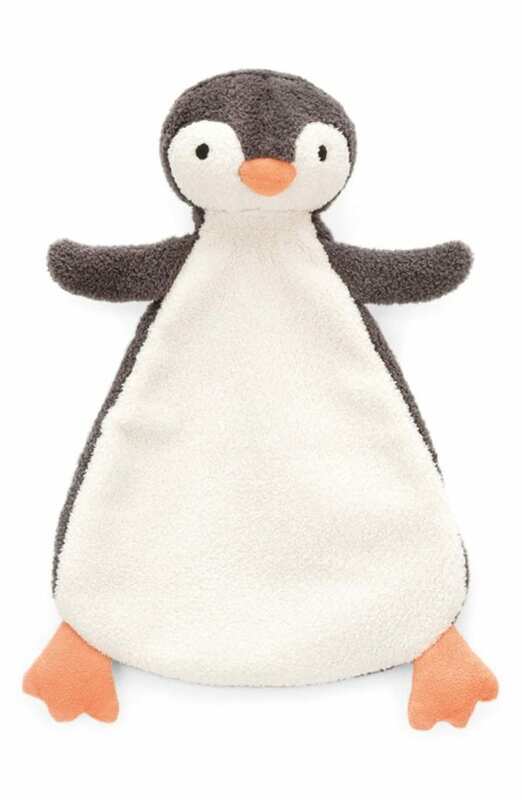 For baby’s first fun with this “magic”, these soft ones from Melissa & Doug are perfect. 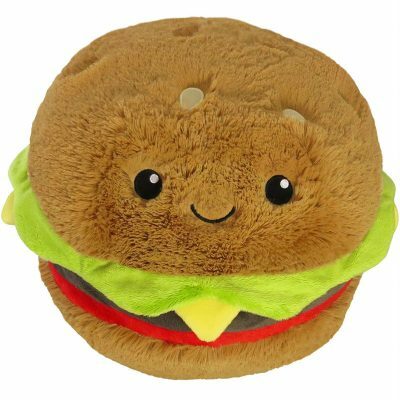 Okay…this is the closest “it” toy we are going to include in this guide. 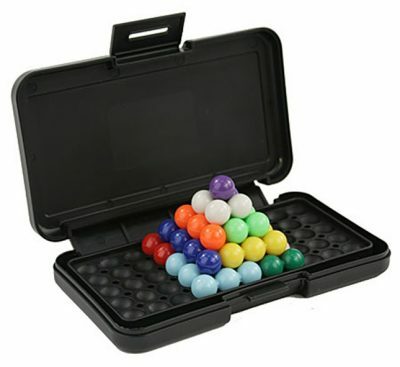 Have you all played with one of these things? 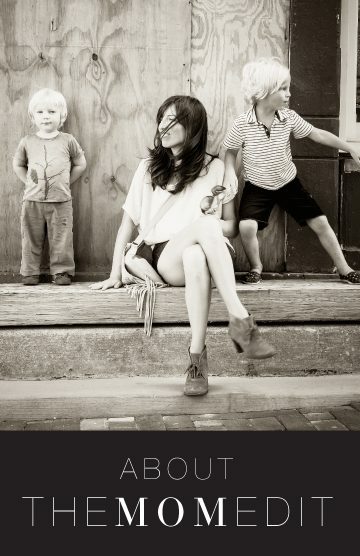 I don’t know who likes them better…the babies or the adults. I am a huge supporter of good wooden blocks, but there are periods of time when those need to go up on a shelf for a bit until baby stops chucking them at your head. 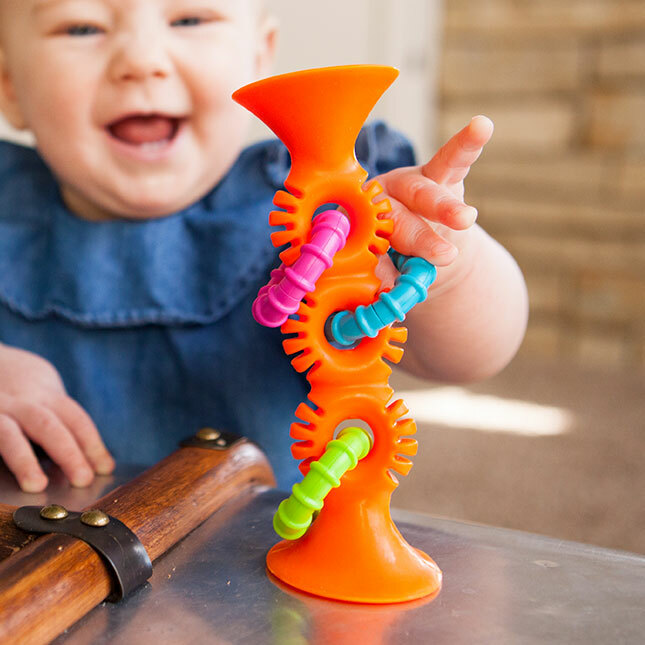 Many times this also coincides with teething —when little one’s building toys need to perform double duty. 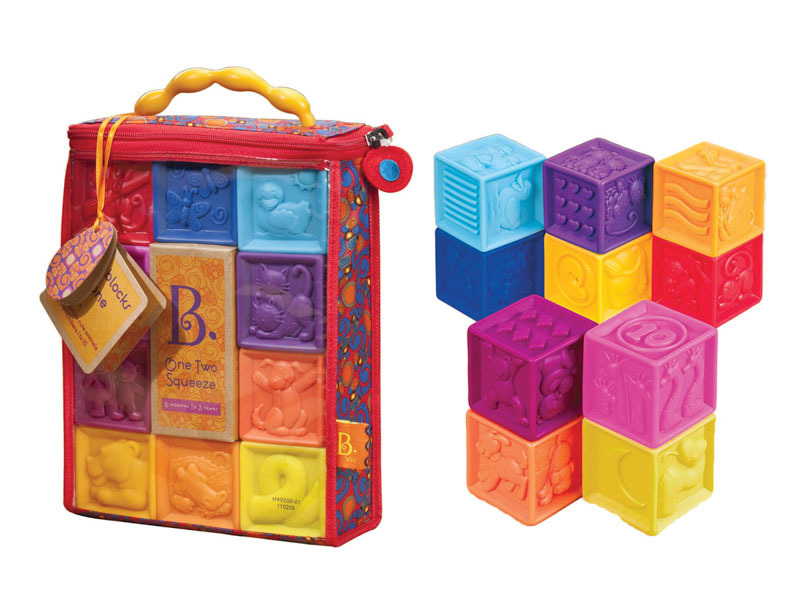 These were our favorite blocks for these times…easier to actually stack than fabric blocks, appropriate for a good chew, and don’t knock mama out when thrown in her direction. If you have time and crafty skills, make a prettier version of this with gorgeous fabric and a lot of love. If you don’t have time or the crafting skills, click on the link below and it will be just as good. Babies LOVE looking at pictures of themselves and their loved ones…and it’s such a lovely way to include special people in their play that aren’t necessarily able to play with them in person as often as we would like. We had these with pics of grandparents and my kids still look through them today. So soft. So so soft. My kids did Music Together Classes, and we as a family fell in love with the Remo Gathering Drum. They come in many different sizes and are my go-to for one-year-old birthday gifts (I do take away the mallets, though, for little ones.) Great sound, and what toddler doesn’t love banging on things! Had to put the Ukulele in too, because it got equal love in our family music jams…this one was recommended to Shana by a musician friend. Shana and I had the same requirements for push toys. They need to be sturdy and they need to be able to hold “stuff”. 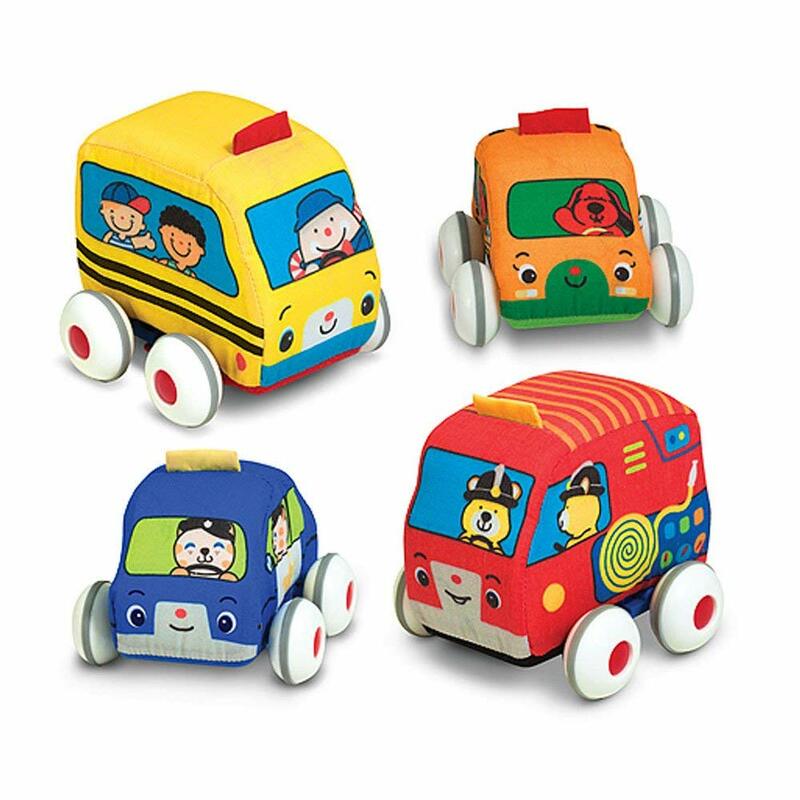 All sorts of things need to be able to take a ride in that push toy….books, blocks, stuffed animals, the cat, and sometimes of course…the toddler themselves. 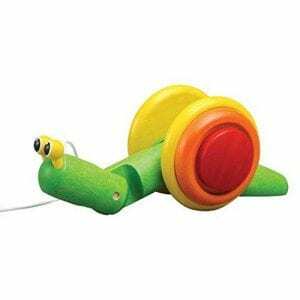 My brother-in-law gave my older son this silly snail for his first birthday, and it was SUCH a hit. He pulled it all over every park in this city — and back and forth between the kitchen and living room for miles and miles. Plan Toys has other animals as well, but the way this little snail “body rolls” (can’t think of how else to describe it) is just too cute. This was Shana’s kids’ favorite. It zooms across the floor — and for the thrill-seeker, there’s not much better than that. 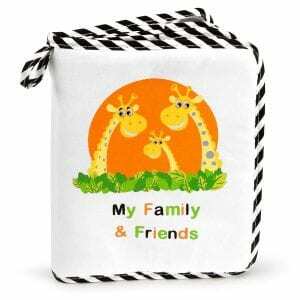 Comes in small and large sizes, and seven different little creatures. 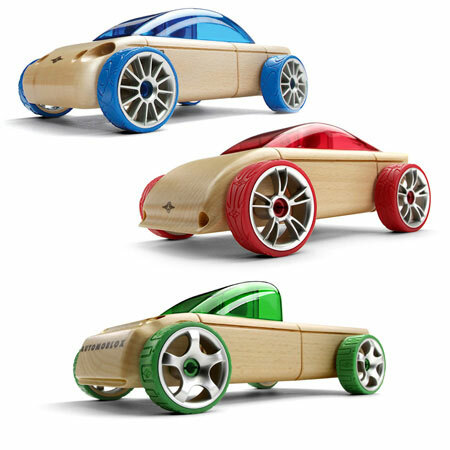 Green Toys makes a great series of vehicles with lots of moving parts to explore. Recommended for age 1 and above (which is nice because many toys with this many moving parts are only recommended for older kids). Added Bonus: Green Toys — Safe for the Earth and Children. It was a sad, sad day when we passed along our KidKraft kitchen to the next little one who would be using it for baking cakes, whipping up stir-fries, and organizing the fridge for the millionth time in one play-session. This special kitchen got so much love from my boys. 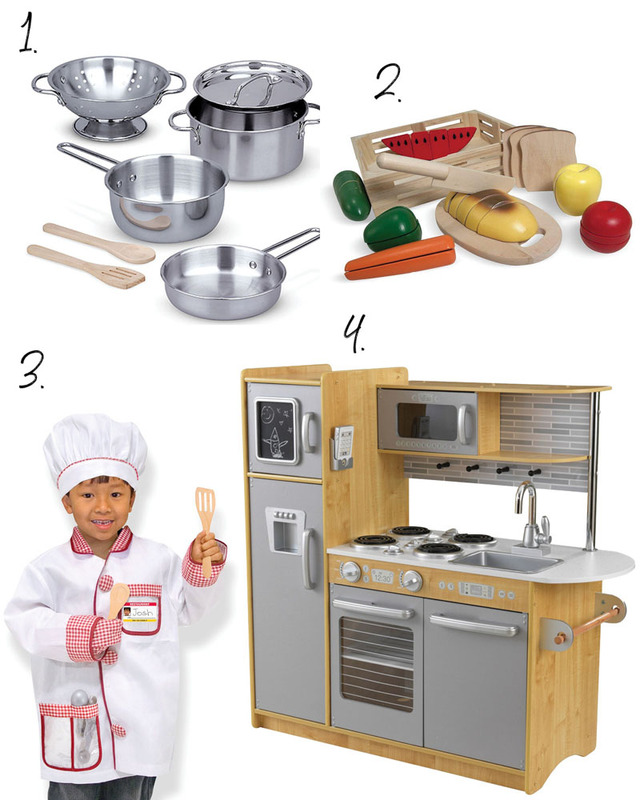 Add the best-ever, play-cutting set (yes, sometimes I hogged this toy and didn’t always share nicely), a set of good pans, and a chef costume (who could possibly cook without the proper outfit, #amiright?) and you are SET! Please note….our KidKraft kitchen took FOREVER to put together (completely worth it! ), but don’t wait until the last minute if it’s a gift. I can still hear this shopping cart being pushed down the hallway…we had a lot of shopping to be done between our living room and kitchen. 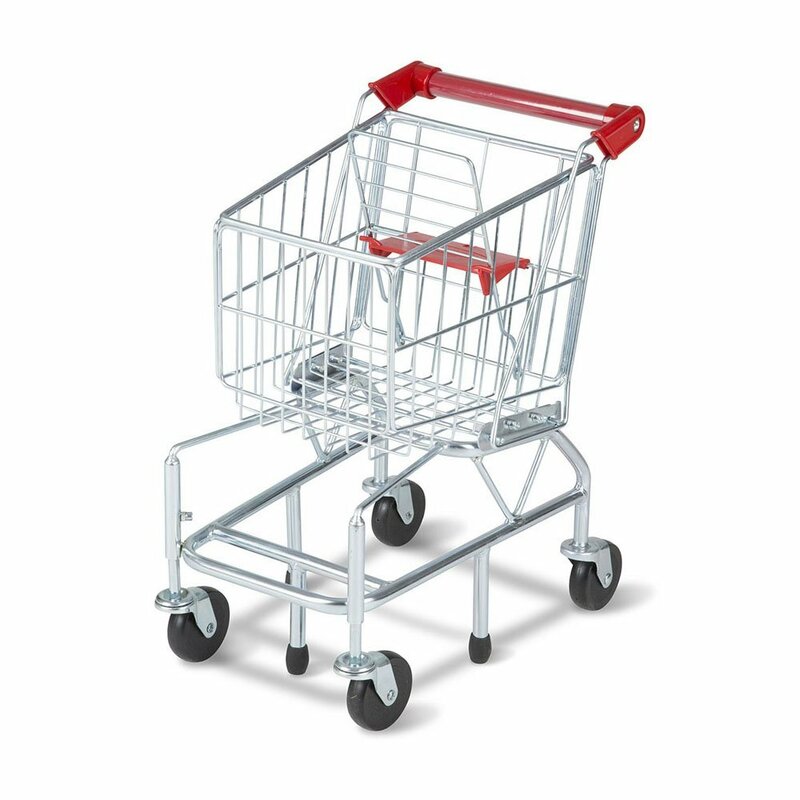 Seems strange to have a category just for kid-sized shopping carts, but this one is so good it definitely deserves its own category. Want your kid to learn how to ride a bike easily and early? This is the bike you want. 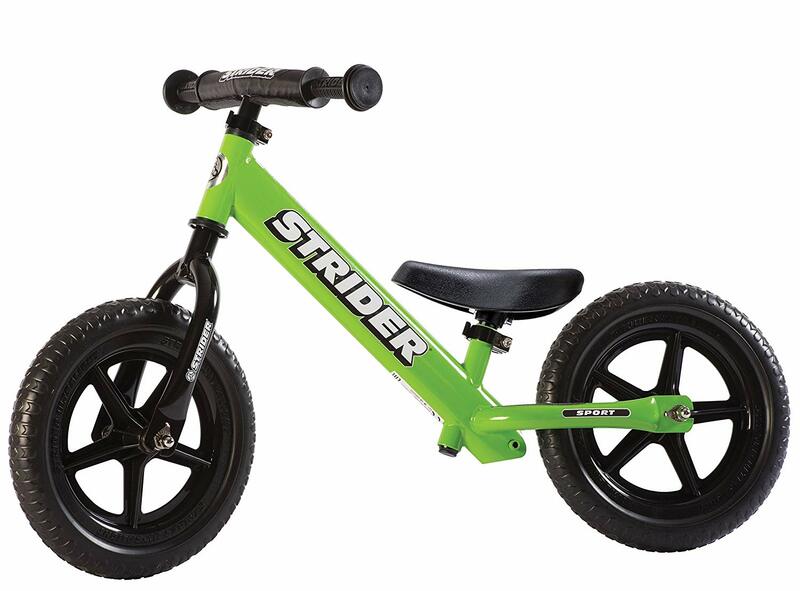 It’s probably not too early or too late, you can start riding this bad boy at 18 months all the way up to 5 years. I copied this idea directly from my good friend E, and it was a GOOD one. A photo of various loved ones for your kiddo to look at or talk to during meal times (or really any other time of the day that they want to drag this special placemat along with them). A great gift for nieces or nephews who live far away. Hape does a really nice job with their train sets. Good quality, but not at a horribly expensive price point. This particular set is a gem for the littlest ones. 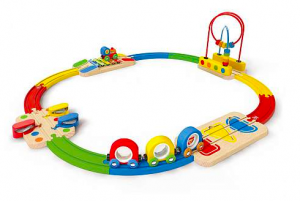 Xylophone Bridge, Tambourine Valley, Kaleidoscope/Magnifying Glass/Mirror Trains, AND compatible with other train sets (including the other main train brands) for expanding sets as they grow older. Vroom Vroom! 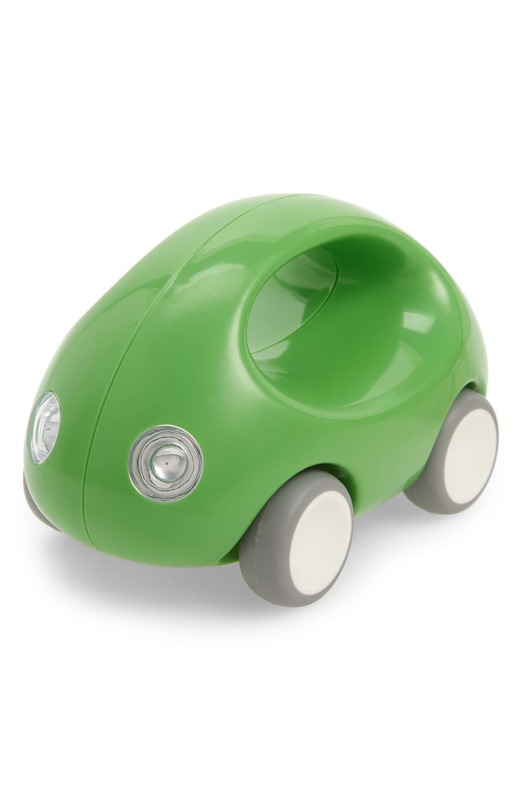 This car goes fast if you give it a good roll across the room, but it can also be easily handled by little hands with the handle on top. Added bonus: comes in a range of cute bright colors. Our superhero characters, LEGO figures, and little dolls and cars have all taken a turn living in our wooden car garage. 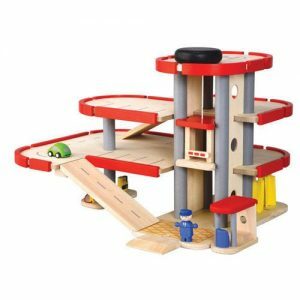 We have the KidKraft wooden ramp racing garage, and although the slide and racing ramp are super-fun for superhero character adventures, it’s a little “loud to look at” and a little too big. The PlanToys Garage is what I wish I would have gotten. 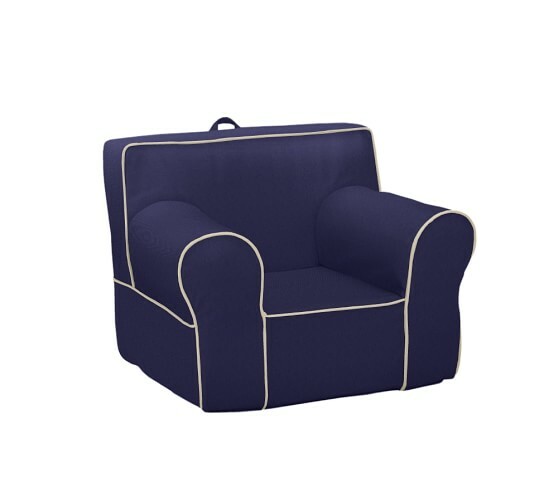 Not as big of a footprint, many of the same features, compatible with Hot Wheels and other little cars, and a little easier on the eyes if it decides to reside in your family room for a bit of time. I honestly don’t know where to start with this one. It’s just the best. Such an easy decision. I wouldn’t even remotely consider any other option. There’s not much cuter than a pre-schooler pulling a roller bag. And an airplane roller bag…even cuter. You wouldn’t necessarily think of a bag as a great gift, but it’s a pretty exciting thing for a little one to be able to pack a bag of their favorite stuff and roll it where they want to go…even if it’s just down the hallway to the kitchen. 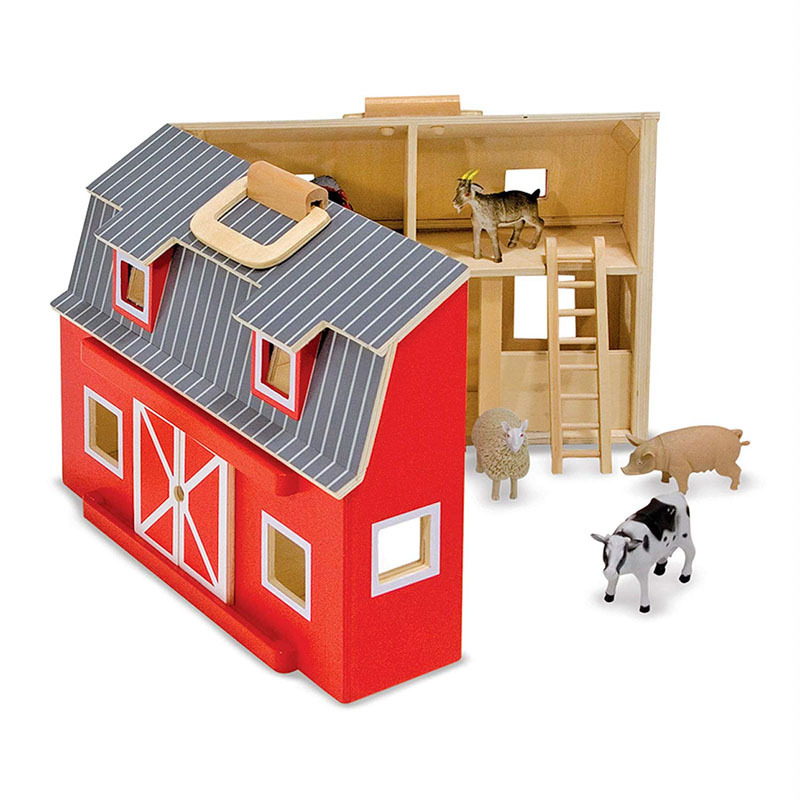 Shana and I both love the simple Melissa & Doug Fold & Go Play Sets. No bells and whistles, which opens up even more possibilities for them to create their own imaginative world. 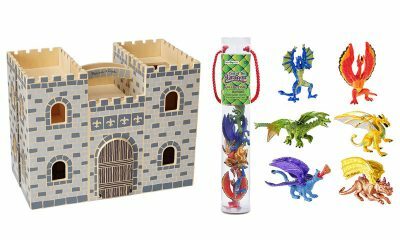 My kids were so into playing with these fun little dragons, but there’s limitless play potential here. Why is it so hard to find good quality dolls that come in a range of skin tones, aren’t horribly creepy, and don’t make weird nosies? Adora Adoptable Babies are the best we have found. Adora babies have options for skin tone and eye color, and this one comes with blue clothing. 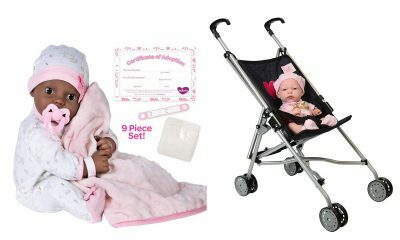 Big enough to fit in real newborn clothing, comes in a little cardboard crib, and with adoption papers so your little one can name baby themselves. My kids were never SO into baby dolls, but my gosh did they push every single thing from the house around in tiny baby strollers. 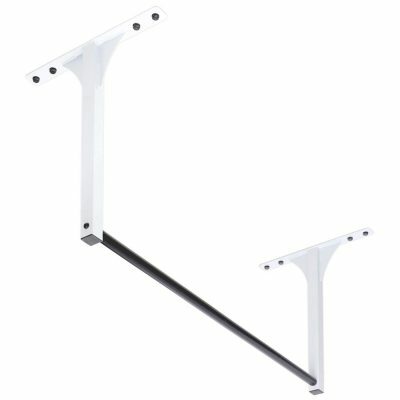 We went through several because they broke so easily, but the one shown below gets great reviews for durability. Put those little ones to work!! They will LOVE sweeping up the Cheerios that fell on to the floor! 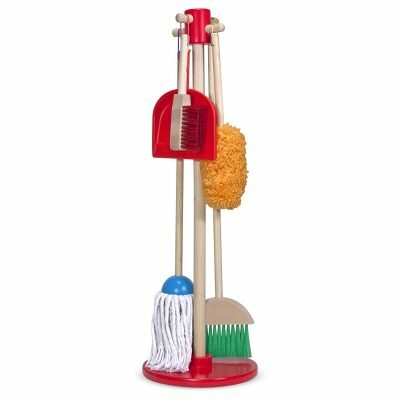 And yes, they can definitely clean along beside you with this adorable house cleaning set. Do I admit that I also shortened the Swiffer handle and added that (with a real Swiffer cloth) to this set? I mean…if they’re going to be sweeping anyway, it might as well be useful…right?? 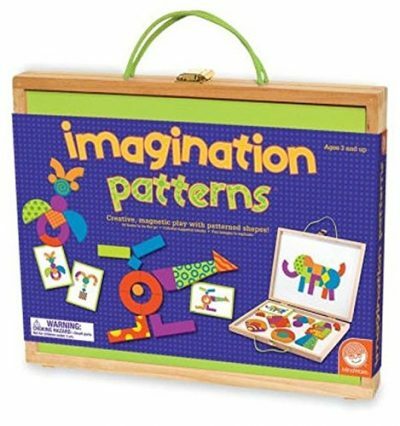 Another great pretend play set from Melissa & Doug. Just enough to get them started on hours of farm animal fun. These are so much fun. You will lose the pieces and that will be annoying, but it’s worth it. Taking them apart, mixing and matching the parts, creating your own design…such fun. It was important to me that my kids could use their hands to actually feel the shapes of the letters in their alphabet puzzle (vs some alphabet puzzles that only have a picture of the letter on the pieces or the image of something that starts with that letter). Playing with these letters blocks, standing them on their heads, stacking them, and eventually playing with the letter sounds and making words with them was such an amazing process to watch. Oh, how kiddos love tiny toys. Tiny treasures, tiny bits of paper, tiny cars, and yes…tiny play sets. Cam did a wonderful post on this set here. 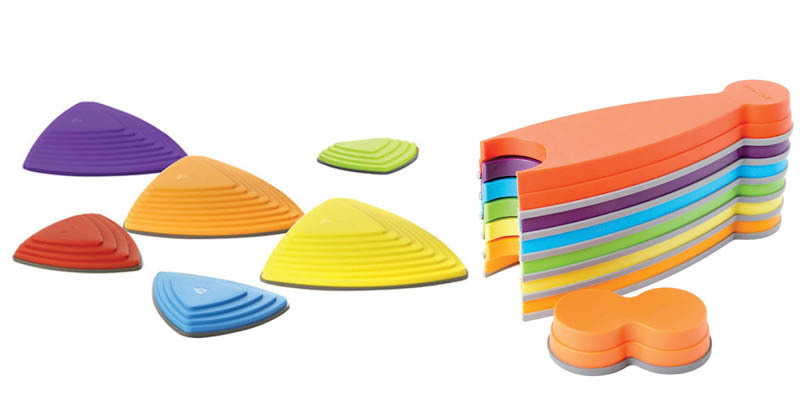 This Sago play set is super-cute, foldable, and can be carried around. 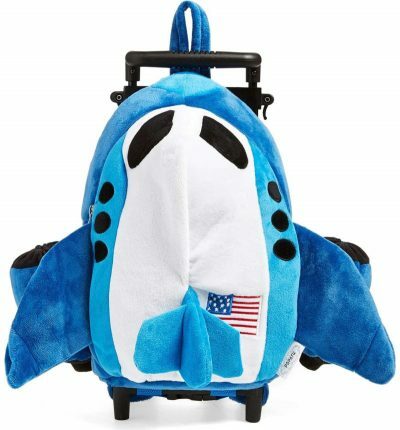 This little rocket set is also pretty darn cute if you have more of a blast-into-space-kind of kid. So many imaginative play opportunities with both. My mother made me a playhouse just like this when I was little. 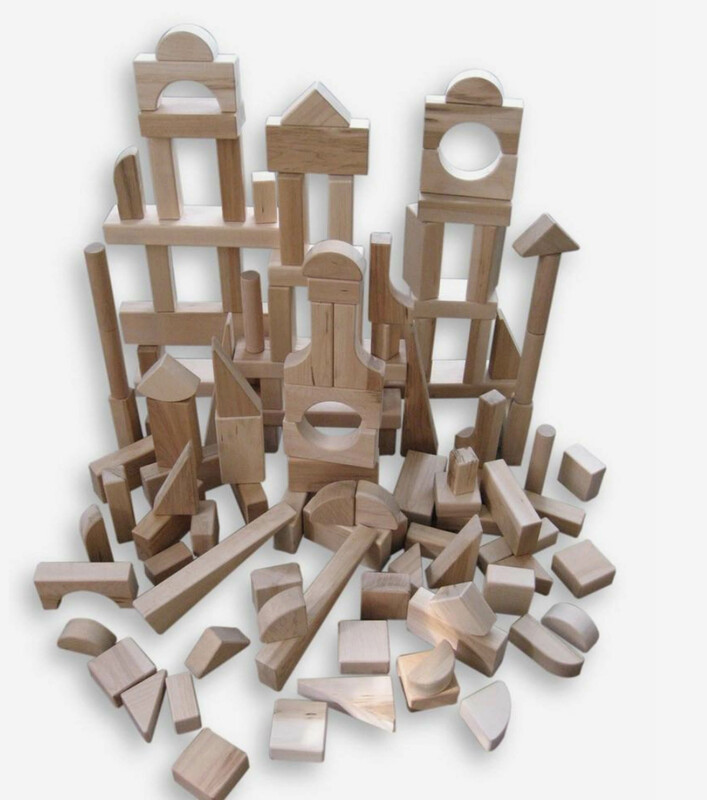 These sit on top of card tables and provide endless opportunities for imaginative play. 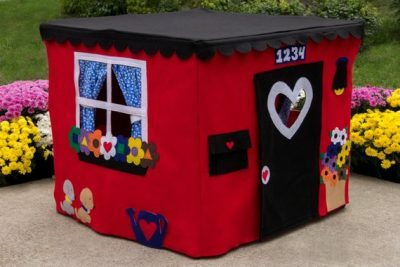 The Pottery Barn and Crate and Barrel Kids forts and playhouses are great (and I do really love the cushions that go with the Crate and Barrel ones), but these custom playhouses from The Playhouse Kid on Etsy won my heart when I laid eyes on them. The Playhouse Kid also offers the pattern if you’re a sewer. So adorable, customizable, and easy storage! 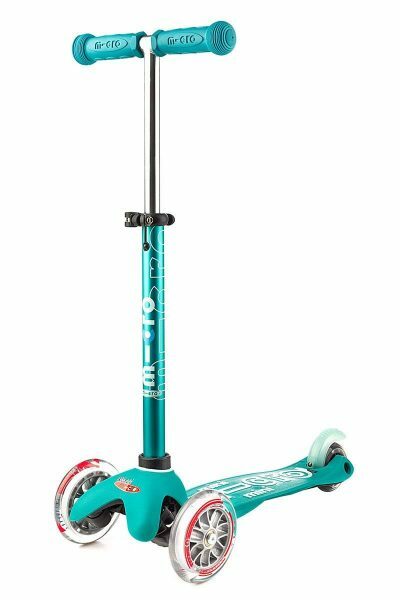 When your little one turns 5, this is the scooter for them. 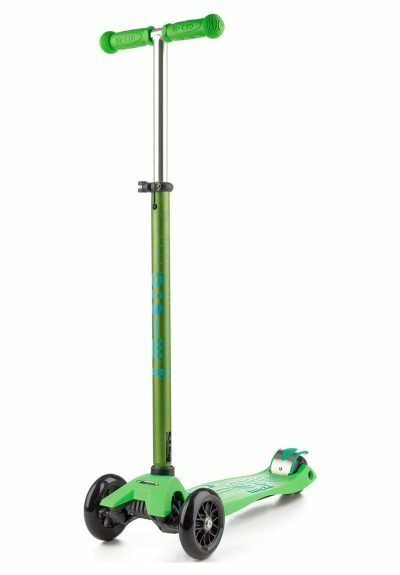 As I said about the Micro Mini (for pre-schoolers), I wouldn’t even consider another scooter. These are the best. I decided to splurge on this pick. My kids have practical sleeping bags that they take camping and we store down in our disgusting basement. But if given a choice, my little one would DEFINITELY pick this one over his. 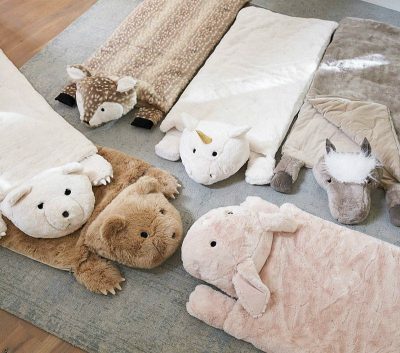 This fabric from Pottery Barn is like a dream, and there’s nothing my little one likes more than soft warm coziness. This would be his own little paradise. I get this out when I have a phone call or need to finish dinner or just need to buy a bit of quiet time. The kids can follow the designs of the cards, but most often I don’t bring the cards out, and my son has more fun with open-ended play by creating his own designs and masterpieces. If you’re going to buy an electronic for your little one to use at certain times, Shana and I both agree that the iPad is the way to go (even if you need to get a used one to fit in your budget). In our opinion, nothing compares in terms of ease of use and the variety of play available with the applications on an iPad. Just make sure you have a sturdy case. My kids are obstacle course engineer masters! This is their most frequent play activity, so we have acquired a variety of “tools” to create the most perfect courses ever. And what are the MOST used toys for these courses? 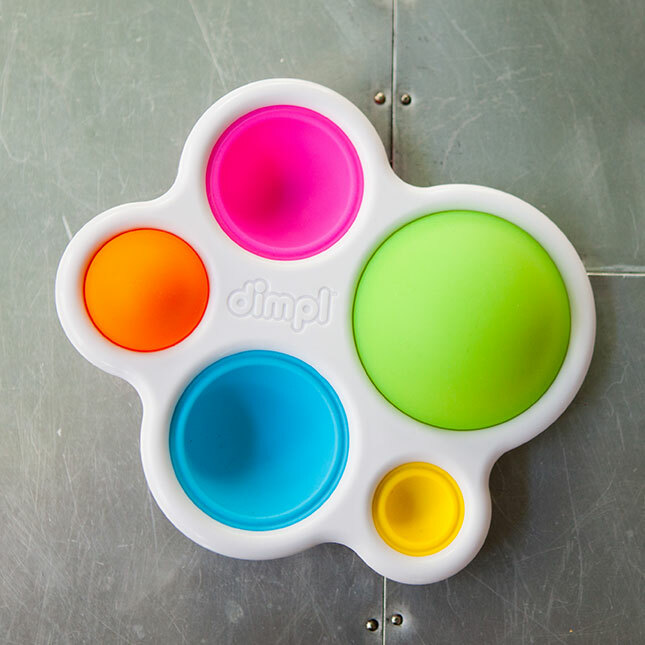 Gonge Riverstones that are actually intended for 3-year-olds to master gross motor skills. 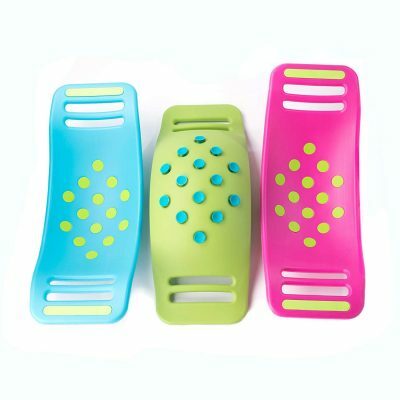 My kids (age 5 and 10) use them almost daily for jumping across their rooms and through the hallways without touching the “lava” beneath them. The Dollhouse decision. Ugh. When you’re making this decision, it feels like it’s the biggest decision in the WORLD…if you don’t pick the exact RIGHT one….disaster. Breathe. It is a major purchase, but we’ve played with many different doll houses throughout the years, and the kids make the best of whichever one is in front of them. I like this Hape Dollhouse. It can be picked up and moved by the top, rooms are easily accessible, it has a pleasing design with plenty of little added touches to make it special. Note that it comes with 4 of the rooms furnished, but there are several additional furnishings (Children’s Room, Dining Room, Pets, Playground) that can be added. I also appreciate that Hape and Small World dolls come in a range of skin tones/ethnicities. We had a whole chest full of trains and train tracks passed down to us, so we got to experiment with a lot of different brands. 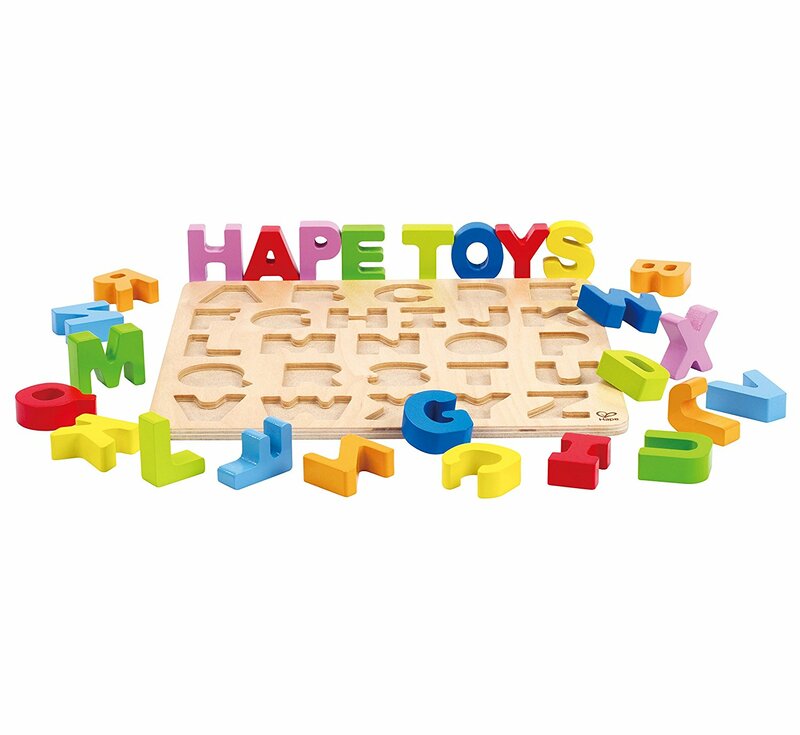 I like Hape as a good quality brand that is not horribly expensive. The most important thing, though, to my kids was that they had LOTS of tracks, and a good variety of ups and downs and curves to create with. 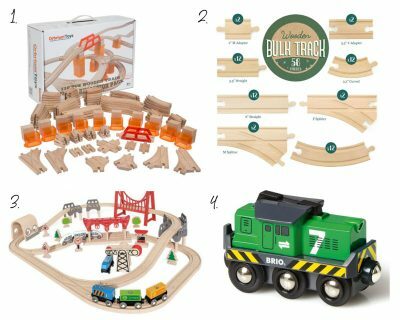 So ….my suggestion is to buy a starter set that comes with some fun props (cranes, bridges, etc.,) and then supplement with packs of additional track. The more the better (if you have room), so they can create a railway system through the whole living room! Now THAT’S fun! Also..I am not usually a fan of battery operated toys, but for train play…it’s worth it to have a few battery operated-engines. We liked the Brio ones. 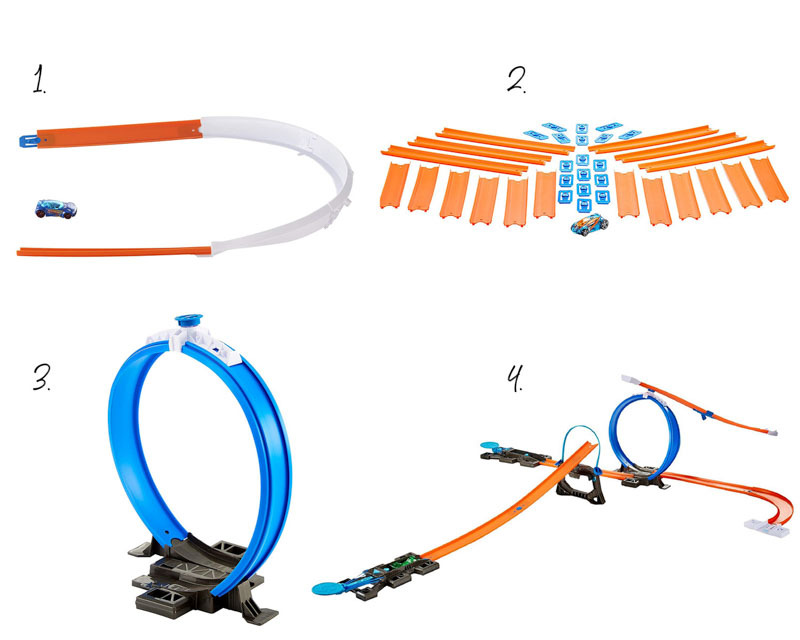 We have found Hot Wheels tracks to be similar to train tracks — it doesn’t actually matter which set you start with, as long as you buy lots and lots of extra track. Giving the kids license to create their own designs with plenty of tracks allows so much more experimentation and creativity. For a full explanation of this choice, read the Nintendo Switch post here. I was pretty resistant to a video system at all…until I looked at this system. 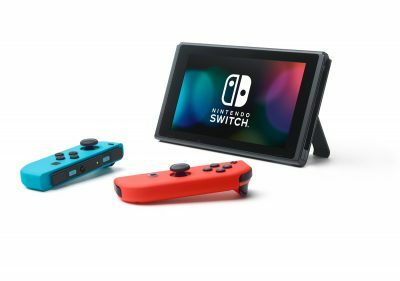 Here are the reasons (abbreviated version) why we chose the Switch: 1. Family-Friendly Games — this was the deal-maker for me (most of the popular shooter games aren’t even available on the Switch.) 2. 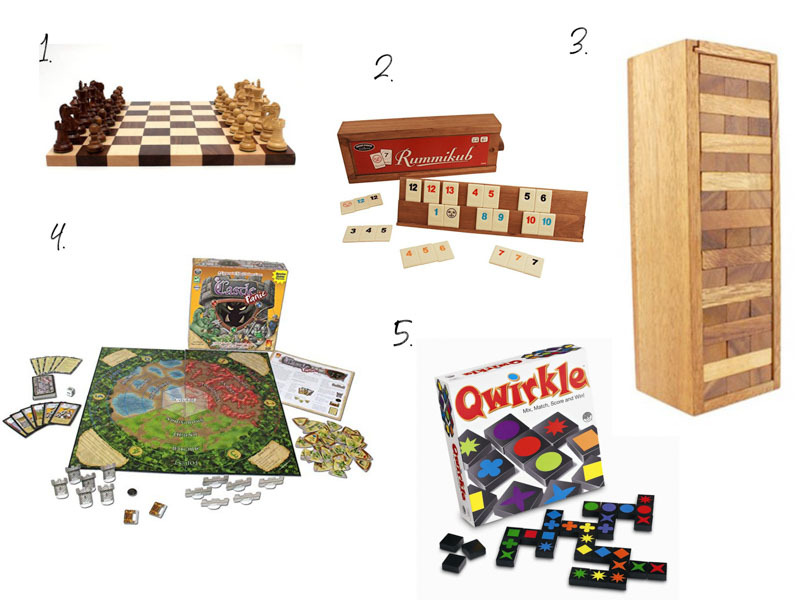 A super-fun selection of problem-solving, adventure, and multi-player games. 3. It’s portable and doesn’t need a TV. If you have a family of serious musicians, you’ll want to get a real piano, but real pianos are crazy EXPENSIVE and a big commitment. Even if you get a used one, you have to pay for someone to get it to your house, and tune it, and it’s big and heavy and…well, it’s just a big commitment (especially for us city folk without much space). Buying, however, a $40 cheap toy keyboard from Target is just that….a toy. 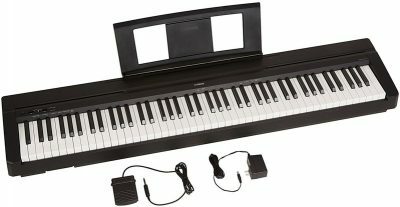 There’s not much room for “musical growth” with those types of keyboards, and I have found that sometimes lesser quality instruments (like art supplies) don’t get used as much. Our family decided to try and hit the “sweet spot” with a digital piano. We wanted it to be full size, with weighted keys, and we didn’t want the kids to be too distracted by a ton of bells and whistles. This Yamaha (super-similar to what we ended up with) meets all of those requirements. As many of you know, really high-quality digital pianos can be thousands of dollars — so don’t expect grand piano quality from this one, but it sounds and feels just right for us (a slightly musical family). 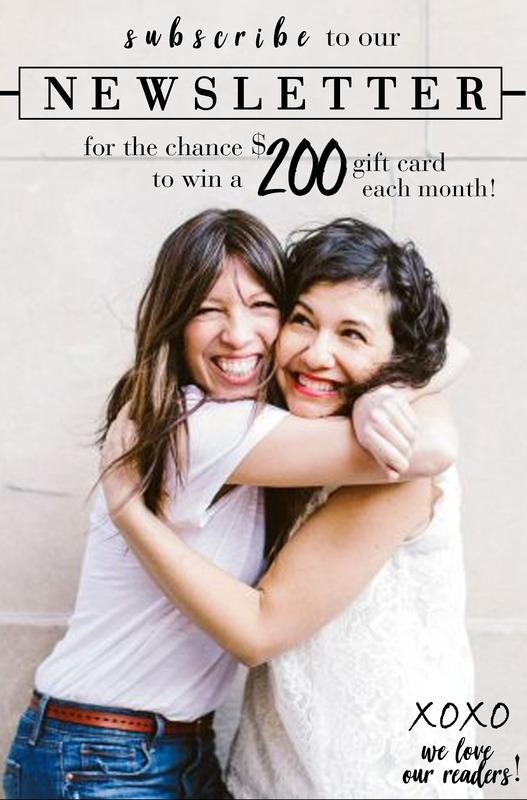 Shana and I (crazily….yes!) both have these on our ceilings. They are AH-MAZING! My older son has SO much energy in that little body of his, and swinging and hanging and pulling up on these bars is not only fun, but really helps him to focus his energy. Just make sure (obviously) that you have someone who knows what they are doing install them. The mat we have underneath has been so well worth the crazy expensive price tag — lets me breathe a little easier when they are swinging like crazy, and they use the mat for all sorts of rough and tumble play. 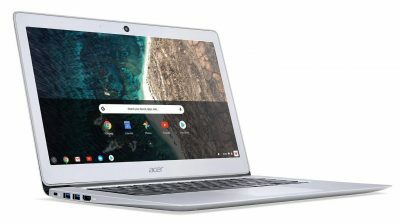 We bought my older son (10 years old) this Chromebook as his first computer last year, and it has been such a good decision. We are a Mac family, but Macs are SO expensive, and he uses a Chromebook at school, so the transition has been seamless. He can now easily navigate Google docs, emailing his teachers (and his grandparents when we make him), and has no problem accessing Google classrooms and websites they use at school. We’ve started him on daily typing practice through TypingClub.Com (so good! ), he has started typing all of his school assignments, and most importantly…..we aren’t fighting over who gets the computer after school. Why they love these things….I do not know. But, they do. This was a gift from my parents (one for each kid to have in their room) and it has really been a good one. Fun for grown-ups to play as well…it’s one of the first things (after they swing on the bars) that kids play when they come to over to our house. 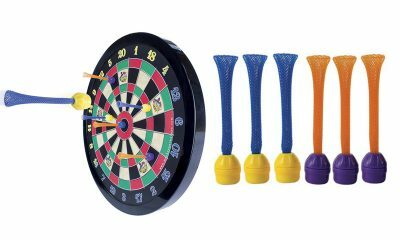 Buy extra darts if you get this. Weirdly addictive. Twist your brain to figure out spacial 2D puzzles and 3D pyramids. Basic levels for younger kids and challenge levels for the older ones. Small and easy to throw in your purse too. 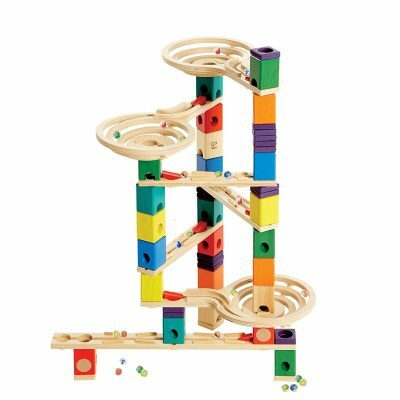 Besides wooden blocks and Magna-Tiles, this marble run has been our favorite big building toy. It is NOT easy…and it CAN cause frustration, which is why we put it in the big kid section. The frustration and difficulty, however, is what makes it truly wonderful. You can see their little brains churning trying to problem solve why the marble is getting stuck in one spot or the course isn’t quite balanced. My son got this when was he much younger, and he played with it a lot (with my assistance), but he has continued to play with it through the years, and now can make really elaborate and cool runs. You need some good flat floor space or a big table to really make this work. We keep it in a big bin, and then bring it out at different times to spend a week or two playing with it, then it goes back in the bin for another time. It is more fun if you have more pieces (like most building sets). We own this one and this one. 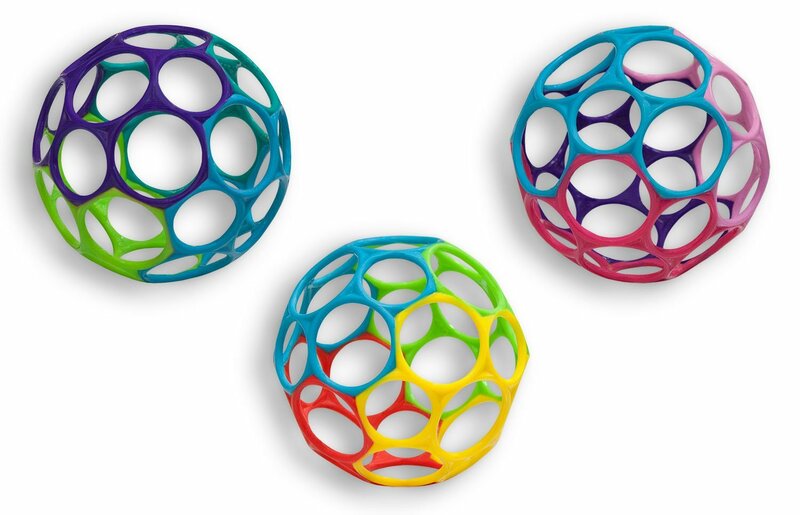 If you haven’t played with these, they are another weirdly addictive little tiny amazing toy. 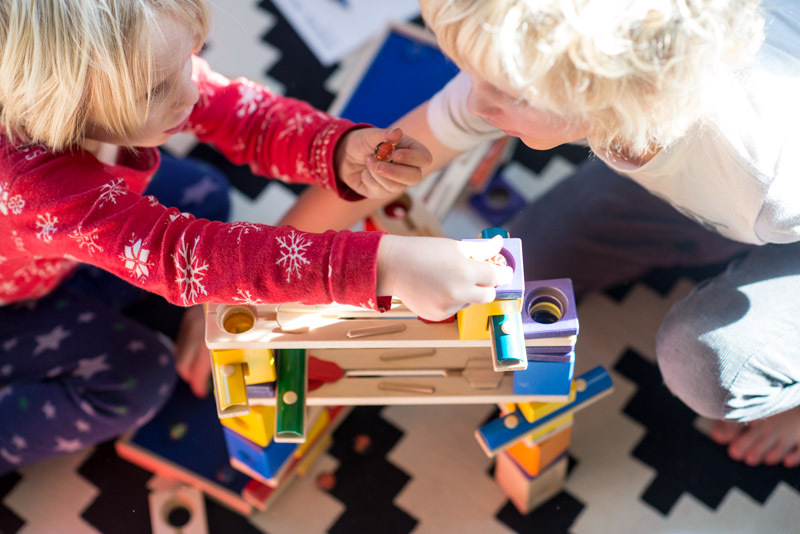 My kids build with them flat and three-dimensionally, Shana’s kids set them up in little battles, and I just fidget with them because they feel great in my hands. Super good for restaurants or travel because they’re so small. I like having a little tube to throw in my bag, but we also have a big supply in a bin for home play. It has been a difficult process trying to figure the “music thing” out. I love for my kids to listen and dance to music, but I do not love for my kids to have to look at a screen to do this…they just get too interested in the picture on the screen or scrolling through to find the next song and don’t enjoy the actual music. We tried various kid CD players and even a record player, but it was expensive to keep up with their tastes, and annoying to try and take care of the CDs and records. We eventually got an Echo and they LOVE it! They pump up the volume and have crazy dance parties in their room, set timers on their own when I tell them they have a certain amount of time to get something done, and ask for the weather before getting dressed in the morning. 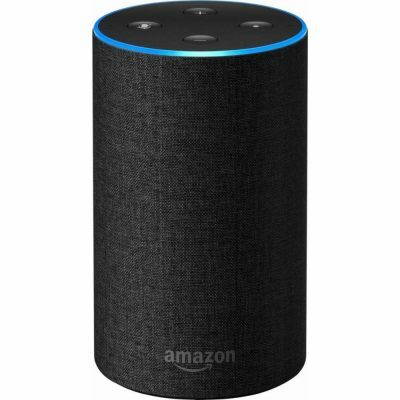 Yes…it’s annoying to hear “Alexa, Alexa Alexa”, a million times each day, and we definitely have “No Alexa times ” in our house when I’ve had enough, but overall the benefits DEFINITELY outweigh the negatives. Kids love headphones. Most of us do, right? It so nice for all of us at times to be able to escape into the world of an audio book or amazing playlist in our own personal space (the introvert in me is getting chills just thinking about this). My kids have these Kidz Gears. They’re fine, but we have had to replace a couple broken ones through the years. 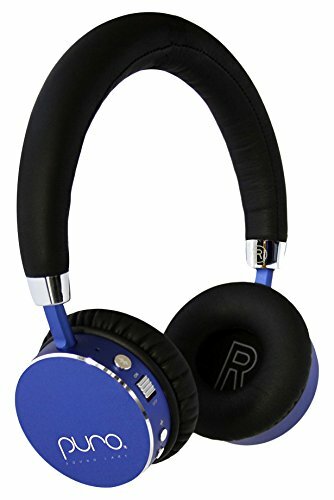 People rave about Beats, of course, but $350 headphones for the kids is not in our budget. I think the perfect balance of quality and price (still expensive, but would make for a really nice gift) are these Puros. Great reviews (both online and from personal friends). This set is the coolest and really should be in the little kids and big kids section. 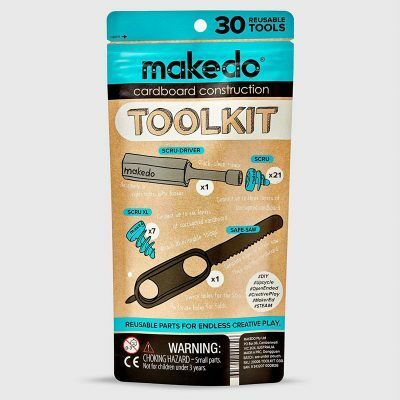 There’s nothing quite like building with cardboard — and these tools make it so much easier to create incredible projects. Shhhh….but my kids are definitely getting a few sets of these for the upcoming holidays. Phew! And that’s it, folks! Thank you, TME, for giving me the opportunity to put this guide together. Was so much fun to remember so many of the wonderful toys my family has enjoyed over the years. Happy playing everyone!